Designed by Wildlife Biologist Gene Naquain. Features side panels to shield quail & limit pest access. 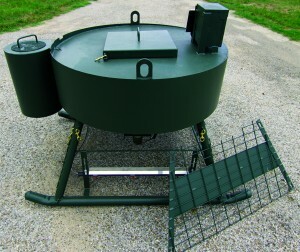 Adjustable water drippers & feed pan. Equipped with an Eliminator Spinner to regulate feed, time and amount dispersed. Save time emptying & cleaning. 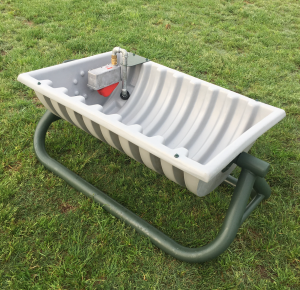 Easily dumps in seconds to clean NEW Roto Molded Trough. 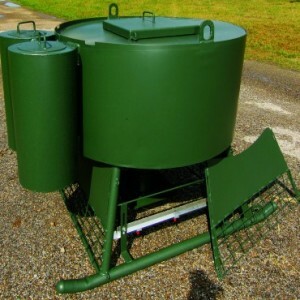 25 Gallon Capacity – $575. 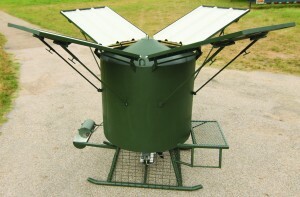 Collects more rainfall and natural condensation for wildlife. For information about NRCS cost-sharing on the Wildlife Guzzler contact your local NRCS office or Outback Wildlife Feeders.